Looking for an Account Based Marketing solution? 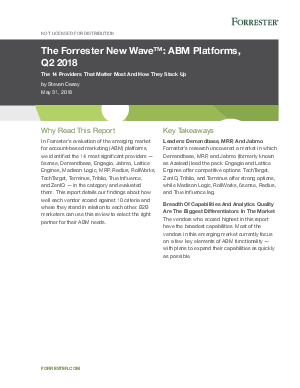 Read The Forrester New Wave™: ABM Platforms, Q2 2018 Report to learn why Engagio was named a strong performer. Customers praised Engagio’s ability to orchestrate marketing and sales motions as well as the breadth and depth of its analytics and assessment capabilities.